"A storied steeple." Traditional Building. http://www.traditional-building.com/Previous-Issues-11/JunePalladios11Keyes.html. 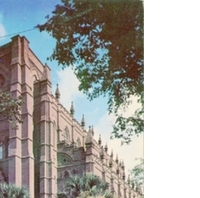 Epting, Roy Jr.. “Cathedral of St. John the Baptist Postcard.” RICHES of Central Florida accessed April 25, 2019, https://richesmi.cah.ucf.edu/omeka/items/show/6766.